Instructions: Card size: Approx. 7 1/2 X 7 1/2 " closed. Start by cutting left side (leaving right 6" as is) with the plain edge of Fleur Border Basics (fold closed far left panel onto the next panel to make a pocket then cut so that when glued down as the pocket, it matches at the top). Cut decorative paper from the Sweet Peony collection to match each panel then glue each paper down to card base except the 6" right side. Slip second to the left down under pocket before gluing pocket down at the top and bottom. Cut an oval from the 6" piece of paper then cut a piece of Fun Foam the same size (6"), cut an oval from it as well to match paper then glue the Fun Foam to the back of paper, glue this stack to card base on the right panel. The oval that was cut out of the paper will go into oval opening, flat to base, so that it sits inside and card is raised up. Cut Decorative borders from white linen card stock and glue to top. Cut a frame for the oval opening with the Eyelet oval and next size down. Cut 2 Festive Holiday dies from white linen (1 will go right side of oval opening and 1 will go left side of outer edge of pocket. Stamp, die cut and color 2 sets of deer, the bunnies and the little birds from Woodsy Critters. Stamp, die cut and color petunia blossoms, Rain Boots & Blossoms flowers and leaves and Wildwood tiny blossoms in 3 colors, purple, pink and yellow. Stamp trees, die cut and color. Shape leaves and blossoms (except petunias) place petunias in Basic Flower Shaping Mold and mist with water. Run through a die cutting machine to form. Pinch each petal (in a pleating fashion) together after removing from mold and let dry completely. 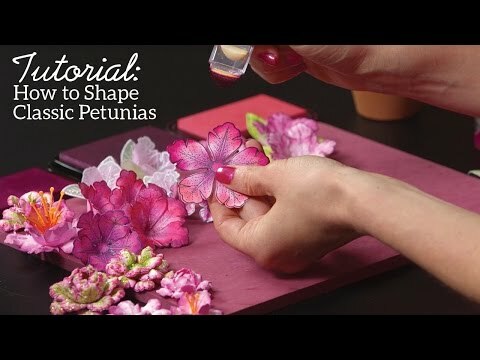 (Some of the petunia flowers made are actually the petunia leaves colored flower colors and shaped like the others). 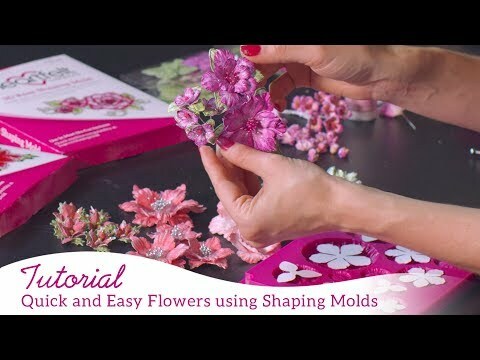 After blossoms are dry, pierce each blossom in the center and insert a stamen in through the holes staggering petals on each layer (place a bit of glue between each layer). Stamp sentiment with Grape Seed and die cut with oval die then edge with Pearlescent Purple. Glue sentiment to center of oval opening. Glue one set of deer to bottom part of oval then glue white oval frame to oval. Glue 1 Festive Holiday die cut to right side of oval. Glue bunny to center panel, glue trees to left pocket panel then glue second set of deer (cut apart) to left side panel even over part of pocket but don't glue that part of the deer down. Glue second Festive Holiday die cut to back of left pocket panel. Cut three tags of different sizes and tie together with pink fiber then slide into pocket. Decorate top right and top left with flowers and leaves. Use foam tape to attach little birds. Put dots of glue at the bottom and add Prills for tiny flowers in the fields.